The end of an old year and beginning of a new one! Though the past few weeks have been full of good food, enjoyable company, and wonderful memories, it's time to "get back to normal!" I'm excited to start this new year and hope to blog a little more consistently. 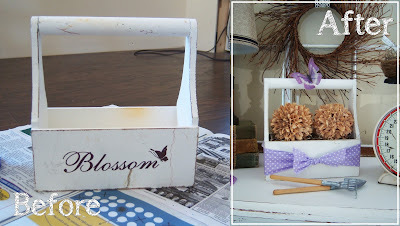 I thought I'd use this post to show you a few of the handmade things I did for my new guest room. Above is a birds nest I made from twine, glue, and Spanish moss. I shaped the nest around a bowl and painted it with a watered down glue mixture. When dry, I added the moss and a blue bird - painted white to match the room's decor. The nest sits atop my antique kitchen scale. Below you'll see a peat pot that I splashed some white paint on; added some dried lavender, a bow, and battery operated candle to. The little toolbox I had was rather scratched up and in need of some paint, a ribbon, and pretty purple butterfly. All three of these items sit atop the dresser. Happy New Year everyone ~ May this year be the best one yet! Love all of your makeovers!